One of my scenes in She Creatures is as Cecilia the Selkie, who is reflecting on her time spent among humans before returning to the sea. She spends the entire monologue doing the thing she enjoyed most on earth: making and eating a bowl of guacamole. Best role ever, or best role ever? I tend to joke around Barnyard that I'll get on board with any event we do as long as there's food, but I'm glad someone's finally taken me seriously enough to give me a part where I get to eat every night. Thing is, although I'm a guacamole fan, I've only made it a few times before, and never while delivering a 4-page monologue. Obviously, guac is not difficult to make, and I'm the only one to eat it in the scene, so if it doesn't taste good I only have myself to blame. I'm mostly worried about doing it in time with the lines without having to spend the entire scene looking at what I'm doing. It's a really great monologue, so I want everyone to be able to focus on the words and not on the inordinate difficulty I have slicing onions. 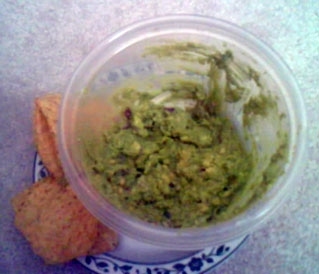 -- Totally edible guacamole! I thought I'd be overwhelmed by onion and jalepeno, but it was tasty! Maddy Ryen is performing in the roles of Cecilia and Helen in She Creatures.